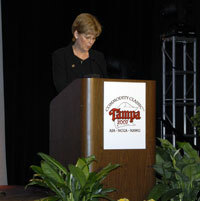 It’s a tradition to have the current president of the National Association of Farm Broadcasting give an opening general session market report here at Commodity Classic. That duty was performed by Pam Fretwell, WTAD/WKAN. She was just hoping that the crowd wouldn’t kill the messenger as she gave yesterday’s dismal market prices. She did point out that it was sunny warm here.